Prince Harry and Megan Markle aren't the only ones having a royal wedding this summer. Lady Georgiana Rannoch is finally getting her happily ever after in Four Funerals and Maybe a Wedding by Rhys Bowen. I first met Lady Georgiana, or Georgia as she is known to friends, last summer when I read On Her Majesty's Frightfully Secret Service (read my review). I have spent the ensuing year getting to know her more by reading through the series. 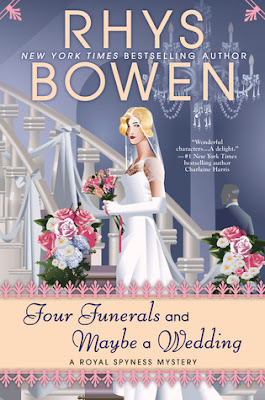 By the time I picked up this 12th book in the series, I was looking forward to the pending nuptials between Georgie and Darcy. Bowen has done a great job of building up to this moment and I'm glad she didn't draw it out any longer. I really enjoyed this book. Having read the series over a relatively short period, I have seen just how much Georgie has grown up. She is no longer the girl living off of baked beans and toast; instead, she is managing a great house. And while she isn't being enlisted by the Queen, she still finds herself entangled in a deadly mystery. I love seeing Georgie and Darcy together solving mysteries, but I think what I liked most about this book was Georgie solving the mystery on her own. She didn't need Darcy to rescue her. I also love how life is coming together for Georgie and Darcy. The 1930s were not the most lucrative times and a lot of people found themselves struggling to survive. I'm sure it was very difficult for those used to luxury and not with a whole lot of skills. I liked that Darcy was stuck on holding on to tradition as a peer. And Georgie would really like to be independent, though family obligations forbid a lot of options to her. I do believe Georgia (and perhaps to some extent Darcy) were a bit shocked by how low they were financially when they went flat hunting. They knew they couldn't have afforded a great London home, but even I was shocked that they couldn't afford even a Mews cottage like Belinda's. The mystery was fun, though slightly obvious. It allowed for time to see Georgie with her mother. Often her mother just breezes in and breezes back out or there are a lot of other main characters around so you just get the self-centered character. But here we see her in a bit more favorable light. I do get the feeling that she really does love her daughter. Which brings up a point that I'm a bit confused about. Georgie didn't know her maternal grandfather growing up and her mother says something about being kept away from Georgie after divorcing the Duke of Rannoch (Georgie's father), but Georgie remembers spending time at Sir Hurbert Anstruther's estate when her mother was married to him. If she could live with a step-father, why couldn't she visit her grandfather? While I did feel like Georgie was coming into her own in this book, I did roll my eyes as she once again questioned Darcy's faithfulness. How many times does she have to be proven wrong before she stops jumping to conclusions? If he keeps doing the job he has been doing, these situations are going to keep arising. Georgie needs to have faith. And speaking of Darcy's future occupation. I would like to see Darcy and Georgie going into the spy business together. They make a good team and perhaps after this case, Darcy will see that Georgie is not a damsel in distress and they can be true partners. With the coming war, I think it would be fun to see them as spies together. There is really no hint as to what the future really holds for these two. It looks like for now they aren't homeless or living in squalor. They might even be able to live a bit of the life they are accustomed to, but I don't think they are truly cut out for the quiet life. Maybe the next book will be about the adventure they find while on their honeymoon - trouble seems to find them wherever they go. I've read the first book in this series and really should read on. I'm glad you enjoyed this one. This week I am featuring Wild Hunger by Chloe Neill. Happy reading! You had me at royal! I love that cover, too. Thanks for sharing...and for visiting my blog. I've read a few books in this series and really liked them. I need to get this one. I'm glad Georgia and Darcy are finally gettingmarroied. I hope something nasty happened to that sister-in-law. Looks like I'm going to have ro catch up on this one. I rarely read books like this but I've been surprised a few times when I read out of my comfort zone. I love the cover! I like cozy mysteries. I'm not sure about 12 books in a series! Sometimes I have a hard time reading 3 books in a series. I might try to find the 1st book and try the whole series! This is one author that I've wanted to try. Yes, I would read more.